PennDOT has launched a public awareness campaign outlining the steps for residents who wish to get a REAL ID-compliant driver license or identification card. Although the REAL ID products will not be available in the Commonwealth until 2019, PennDOT is encouraging residents who plan to get them to start now on efforts to obtain required documents in plenty of time. Those documents include birth certificates with the raised seal, Social Security card, proof of all legal name changes and two proofs of current Pennsylvania address. Assistance with obtaining copies of birth certificates is available at my office; however, it can take as much as four to six months for the requests to be processed by the Department of Health. The federal government has extended the deadline for REAL ID compliance in Pennsylvania to Oct. 10, 2018, so current driver licenses and identifications are still accepted for domestic air travel and entry into certain federal facilities. 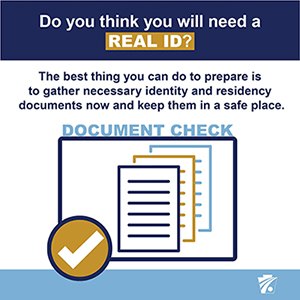 More information about REAL ID is available here and more information about birth certificates is available here. Check Out This Upcoming Event! Mifflinburg Chirstkindl Market: Thursday, Dec. 14, through Saturday, Dec. 16. Market hours are Thursday, 4:30-9 p.m.; Friday 10 a.m. to 9 p.m.; and Saturday, 10 a.m. to 8 p.m. Click here for additional information. Just as it is important to invest in the upkeep of your home or in pursuing higher education or training to better yourself, it is important for the Commonwealth to invest in its infrastructure, environment and economy to ensure a successful future for the state and its residents. To that end, the Commonwealth Financing Authority (CFA), created by the Legislature in 2005, manages a variety of programs that deal with economic development, alternative energy, flood control, water and sewer infrastructure, and other grant programs funded by a portion of Marcellus Shale revenues. These grant programs are very competitive but can make a big difference in our communities. In fact, just last month, the CFA awarded a $100,000 grant to support improvements to Lewisburg’s Hufnagle Park. CFA Multimodal Transportation Fund Program: Grants are funded through Act 89 of 2013 to encourage economic development and ensure a safe and reliable system of transportation in the Commonwealth. Applications will be accepted March 1, 2018, through July 31, 2018, for anticipated CFA board action in November 2018. PA Small Water and Sewer Program: Provides assistance with construction, improvement, expansion or rehabilitation of a water supply or sanitary sewer system. Applications will be accepted until Feb. 28, 2018, for anticipated board action in May 2018.
Business in Our Sites Program: Provides loans for acquisition and development of sites for use by businesses, private developers and others. Pipeline Investment Program: Assists with construction of natural gas distribution lines. Energy-related Programs: Provides grants and loans for clean and alternative energy projects including buildings, equipment and land development activities; grants and loans to individuals and small businesses for high-performance, energy-efficient building projects; grants and loans for geothermal and wind energy projects; and grants and loans for alternative energy production projects involving solar technologies. To help prevent fraudulent use of state benefits, the House recently passed legislation to require more coordination between state agencies. Currently, state departments share contact information of recipients for state programs and may send letters about other state programs or benefits for which they may be eligible. Unfortunately, that contact information may not be up-to-date and may contain information for people who are deceased. House Bill 1588 would require the Department of Aging to cross reference its list of beneficiaries with death records maintained by the Department of Health on a monthly basis. This would help enhance the system and increase efficiencies by more promptly removing deceased persons from their database. The bill now goes to the state Senate for review.